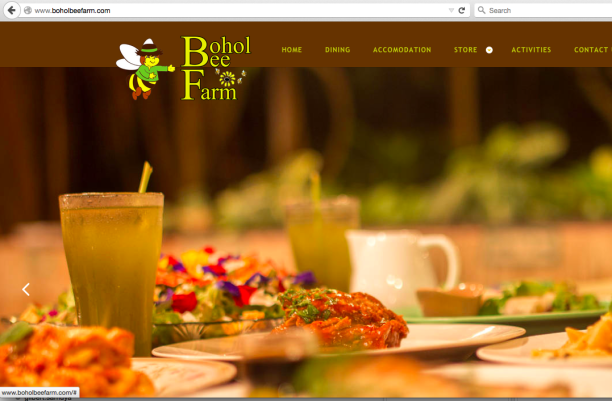 Bohol Bee Farm launched their new website on August 1, 2015 after intense development work by the website development team at Auza.Net led by web developer Jason Tiro and content production with the Bohol Bee Farm management team led by Dominic Butalid and Hyacinth Bongalos. The old website was completely redesigned in order to modernize not only the design but also the backend part of the website. Bohol Bee Farm also upgraded their email system using cloud technologies that now allows them to store several years of emails while providing great user interface and flexible email groups implementations. The new website uses a new design template that is very flexible and Auza.Net is able to customize each page of the website as required by customers. Aside from this design flexibility, the template is also mobile friendly which means the website still looks great even on small screens of mobile devices. Photography was provided by Rhapsody Concepts and the Bohol Bee Farm website was the first website project of Auza.Net that used new photography techniques that enhanced the visual quality of the on-site photos as well as the product shots. Looking at the website photos may actually make one hungry for a delightful dinner featuring original recipes developed by Bohol Bee Farm and using only organically grown ingredients, most of them, farmed on-site. Aside from the main website upgrade, Auza.Net also merged the online store of Bohol Bee Farm. Previously, the online store was a different website implementation and it was not straightforward to unify the look and feel of the main website with the online store. Auza.Net will provide on-going technical support for the new website and email system of Bohol Bee Farm. Screenshot of the main webpage of the new Bohol Bee Farm website.